As I am writing this, I am thinking about how earlier today I sat with my fellow MSBA classmates, toasting the journey, the laughs and our last final week together. However, this is not goodbye, it is “see you later”. None of us embarked on this journey thinking that we would all come so far. However, I can whole heartedly say that I have grown as a young business professional because of every single person I have crossed paths with this summer. Everyone tells me that I have my life figured out. Personally, I don’t think I do because who does at the age of 21? Each internship has given me a glimpse of what I want and who I am. My success is from two things: my connections and being unafraid to be told no. To put it into perspective, one conversation over a game at the Jets led to a phone conversation, which ultimately led to me being told to apply for MSBA. As a class, we have all learned valuable lessons this summer that we will use in our various stages of life. The Class of 2018 is made up of juniors, seniors and recent graduates who all have the passion and desire to break into the sports industry. However, we each may have different goals. This summer, my goal was to solidify what part of the events field I want to pursue. I have had the privilege of being paired with three incredible Mentors: Courtney Sergeant at Engine Shop Agency, Amanda Flynn at Major League Soccer and Brooke Williams at the New York Yankees – all who work with various types of events and activations. I have gained a solid perspective on my future because of each of them: Courtney challenges me in the workforce (and at her spin classes); Amanda is the sane voice that answers my frantic emails when I begin to question everything; Brooke, previously Class of 2015, helps me keep my life balanced, as she knows the struggle of being busy most days from 9am – 9pm. Each one of them has helped me understand where I am going – without MSBA, I wouldn’t have gained this knowledge. On top of this, the network MSBA has is incredible. I cannot tell you how many business professionals are willing to help because I am a part of this program. I can send a quick email to an Alumni, Speaker or Mentor, and I will have a response within a few hours. We have been told of the successful and unsuccessful stories, and there is a common theme – networking or lack there of. As I mentioned, I am where I am today because of incredible networks – from my university (GO PIRATES!) to my previous employers. Having this new network at my fingertips has given me life. I have the ability to shape my career path through each connection, while still remembering that one bridge burnt could ruin everything. That is why it is important to be selective when contacting someone. 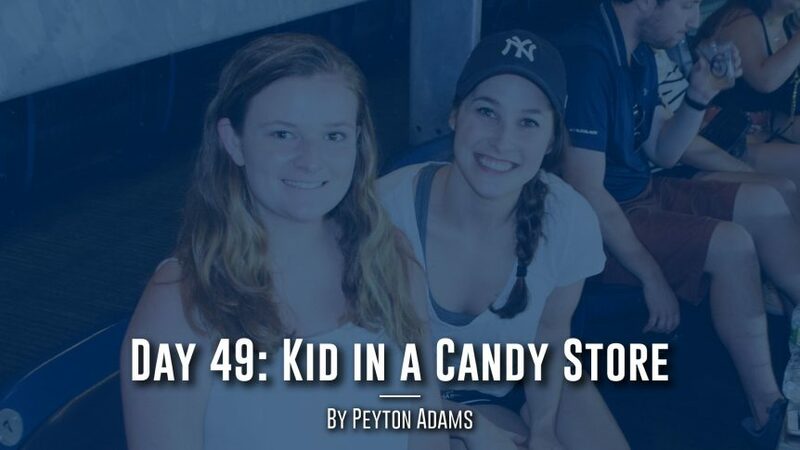 I liken all of this to being a kid in a candy store with all these people around me – I want to be connected with each of them just as I want every piece of candy. However, I have to remind myself to step back and ask myself if all that “candy” is necessary – I have to remind myself that these individuals are busy professionals with limited time. Making solid, strong relationships and nurturing each one was an important goal of my summer. Shout out to Lorne, Bailey and David for this amazing program; thank you each for allowing me this opportunity to meet these incredible business professionals and, of course, the Class of 2018. Thank you Class of 2018 for continuing to show me why I have a drive to be in sports, for the endless conversations over random things, for the heated debates over sports (especially free agency), for the sushi gang and for everything else!